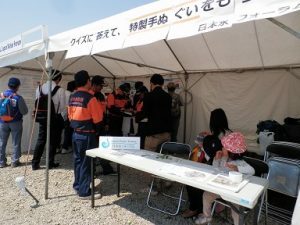 On May 21st, the 65th Flood Fighting Drill took place in the Tonegawa River basin in Toride, Ibaraki Prefecture. 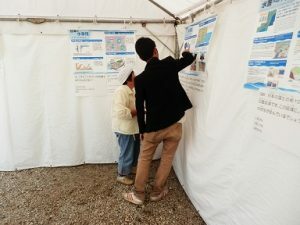 This is an annual event organized by MLIT and riparian municipalities along the Tonegawa River, with the aim of handing down Japan’s traditional flood prevention techniques and raising awareness of flood prevention. 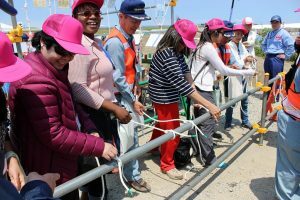 Based on the lessons learnt from the Kinugawa River flooding caused by heavy rains in the Kanto-Tohoku region last September, a series of practical training sessions took place. These included river patrols during times of flooding, information transmission, flood fighting methods, and rescue and evacuation. 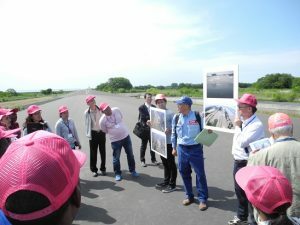 The JWF organized the Flood Fighting Drill Tour 2016 for officials from embassies and international organizations in Tokyo, with the aim of conveying our experiences and the knowledge learnt from various disasters to the rest of the world . 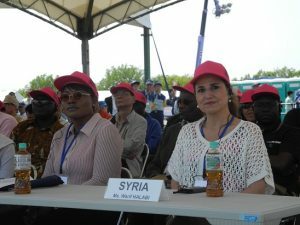 Officials from thirteen countries participated, including the Charge d’ Affairs of the Syrian Arab Republic. In the exhibition area, the JWF operated a booth in order for visitors and participants to learn about the current situation regarding water around the world. We offered a quiz on water with the aim of raising public awareness. 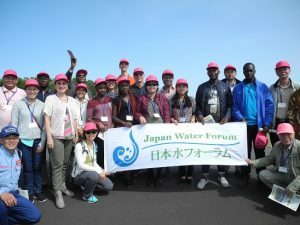 The JWF intends to provide information about Japan’s traditional flood fighting techniques and the establishment of disaster prevention systems based on public-private partnerships. 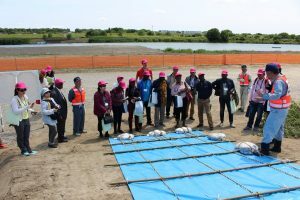 Transmitting Japanese knowhow to the world, the JWF continues to help enhance flood prevention capabilities throughout the world. 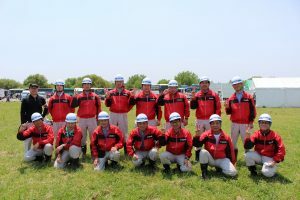 In the first part of the tour, drills were conducted under the scenario of a heavy rainfall similar in size to the Kanto-Tohoku Heavy Rains of September, 2015. From the warning issued just before the disaster to the evacuation order because of the risk of flooding, the drills were carried out with a feeling of real tension. Participants were impressed by the carefully thought-out communication system. The second part consisted of training in rescue and first-aid. Visitors were shown specially customized bikes, amphibious vehicles, helicopters, and special boats. They carried out joint exercises for surveillance, rescue and first-aid. 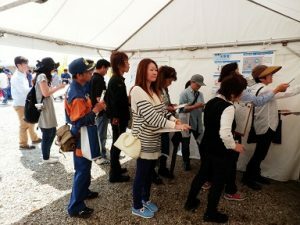 They remarked on the high level of flood prevention methods in Japan, and became aware of the importance of participating in such drills. After the drill, the group visited Inatoi Pond, which serves to mitigate flood waters. Mr. Oguri, deputy director of the Tonegawa-Jyoryu River Office at the Kanto Regional Development Bureau, MLIT, and Mr. Akiya from the Toride branch office of the Tonegawa-Jyoryu River Office, explained the flood prevention measures taken during the Kanto-Tohoku Rains last September and used a display of pictorial panels and printed materials to emphasize the importance of flood control reservoirs. 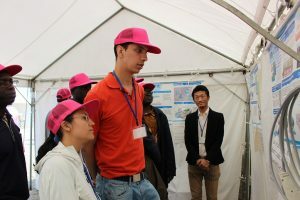 Some participants were interested in the functioning and construction of flood control reservoirs. Others expressed an interest in introducing similar technology in their own countries. About ten thousand people visited our exhibition booth, including members of fire-fighting teams and other visitors. The JWF gave a quiz on water to raise awareness at home and abroad. We had about 170 participants. Some commented that the display had made them interested in water, and some said that they wanted to know more about water issues in Japan and around the world.